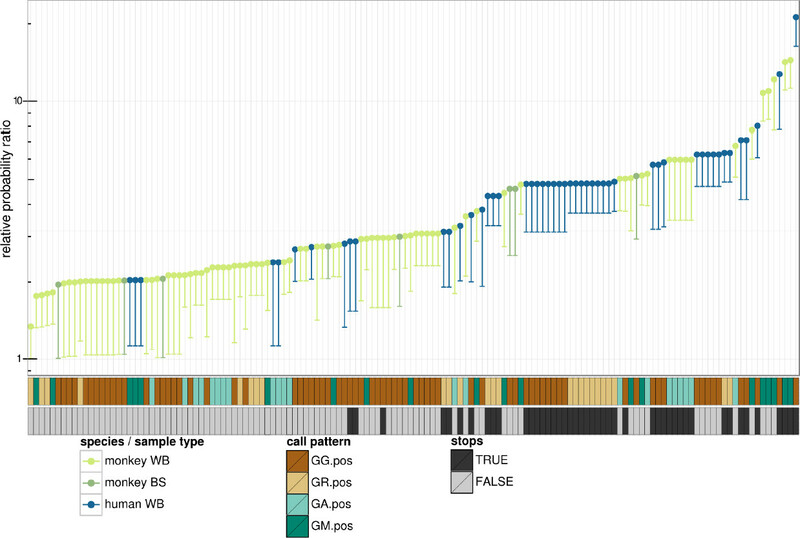 The Maximum A Posteriori relative probability of hypermutation in SFV sequences derived from monkeys (green) or humans (blue) demonstrating that human sequences are shifted to the right and therefore more likely to be hypermutated (top). The most common dinucleotide context for each sample (middle) and presence of non-sense mutations (bottom) are also shown for each sample. Image from Matsen, et al., 2014. Foamy viruses are a group of retroviruses that ubiquitously infect primates and some other mammals. Every examined primate except humans is infected with a simian foamy virus (SFV), and these viruses have co-speciated with their hosts for millions of years (Switzer, et al., 2005). SFV is latent in most infected monkey cells, including blood cells, and only replicates in oral mucosa. Infectious virus is thought to be secreted into the saliva from the oral mucosa. Humans in contact with monkeys are frequently infected with SFV through contact with monkey saliva; however, the virus does not replicate efficiently in humans and there has been no documented case human-to-human SFV transmission. Thus far, there do not appear to be pathogenic consequences of SFV infection for either monkeys or humans. It is currently unclear why SFV does not efficiently infect humans. To understand this difference in host susceptibility, the laboratories of Lisa Jones-Engel (University of Washington), Maxine L. Linial (Basic Sciences Division) with their longstanding collaboration exploring the epidemiology and virology of SFV, teamed up with Erick Matsen’s laboratory (Public Health Sciences Division), along with an international team of collaborators, to develop a Bayesian approach to identify APOBEC-mediated hypermutation in SFV DNA. In a recent paper published in PLoS Computational Biology, Matsen, et al. demonstrate that human APOBEC3G mutates SFV and likely represents a barrier to cross-species transmission. APOBEC3s are a family of cytidine deaminases that generate an excess of G to A mutations (hypermutation) in the viral genome during reverse transcription. Hypermutation results in nonsense and missense mutations that can prevent further viral replication by disrupting viral proteins. Individual APOBECs act on different nucleotide contexts. For example, APOBEC3G induces mutations in a GG dinucleotide context. Traditionally, Fisher’s exact test has been used to identify signatures of APOBEC3-related hypermutation. However, this statistical test is inaccurate in situations with modest rates of hypermutation, as is the case with APOBEC3. To address this and other shortcomings with the Fisher’s exact test, Matsen, et al. developed a Bayesian approach to more accurately quantify the rate of mutation within a particular APOBEC3 context relative to the rate of mutation outside this context. This approach also provides a measure of the effect size, e.g. if APOBEC3 can act in a given context what is the probability that it will mutate the sequence. Overall, this Bayesian method is more accurate than currently used methods to quantify hypermutation in a given sequence. To determine whether APOBEC3 inhibits SFV replication in humans, Matsen et al. assayed the SFV gag gene, which encodes the viral structural proteins and is the most variable gene in SFV, for signs of hypermutation. In gag sequences derived from either free-ranging macaques or from the blood of zoonotically infected humans the team found that human-derived SFV sequences had significantly higher levels of hypermutation comparing either blood samples from the two species (p = 1.7×10-4) or comparing human blood samples to macaque buccal (p = 4.3×10-4). Furthermore, hypermutated human sequences were significantly more likely to contain stop codons in the gag coding region (p = 6.5×10-13) that would prevent viral replication. Hypermutation in the human samples was primarily associated with either GG or GR dinucleotides, while the macaque samples were most frequently in GA or GM dinucleotide contexts, suggesting that different APOBEC3 family members may be active in the different species. Taken together, these data suggest that APOBEC3G presents a barrier to the cross-species transmission of SFV to humans. Matsen et al. have developed a new, powerful tool to more sensitively identify signatures of hypermutation. In the current study, this Bayesian approach demonstrated that human-derived SFV sequences has undergone significant APOBEC3-mediated hypermutation, providing indirect evidence that the virus does go through at least one round of replication in humans. Going forward, "another interesting question is whether the non-structural SFV protein Bet is involved in protecting the virus from APOBEC3-mediated hypermutation," said Dr. Maxine Linial. Matsen FA 4th, Small CT, Soliven K, Engel GA, Feeroz MM, Wang X, Craig KL, Hasan MK, Emerman M, Linial ML, Jones-Engel L. 2014. A novel bayesian method for detection of APOBEC3-mediated hypermutation and its application to zoonotic transmission of simian foamy viruses. PLoS Comput Biol doi: 10.1371/journal.pcbi.1003493. See also: Switzer WM, Salemi M, Shanmugam V, Gao F, Cong ME, Kuiken C, Bhullar V, Beer BE, Vallet D, Gautier-Hion A, Tooze Z, Villinger F, Holmes EC, Heneine W. 2005. Ancient co-speciation of simian foamy viruses and primates. Nature 434(7031):376-80.